According to Planned Parenthood’s website, most women “ultimately feel relief” after having an abortion. In fact, the website asserts that sustained “emotional problems” after an abortion are not typical—just like when a woman has a baby. “I’m here to refute those words,” said Andrea Pearson, regional coordinator from the pro-life organization Silent No More. 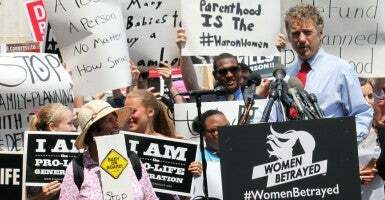 Carrying a sign reading, “I Regret My Abortion,” Pearson shared her story at a #WomenBetrayed rally outside the Capitol on Tuesday, along with other speakers in the pro-life movement. When Pearson was 18 years old, she became pregnant. After going to Planned Parenthood, Pearson said she left the clinic feeling as if there were no alternative options. She wasn’t counseled. She wasn’t told of the consequences ahead. She just made an appointment and left the clinic. When Pearson went to Planned Parenthood for the procedure, she justified the abortion by arguing that it was legal. But once she left the clinic, Pearson said she felt shame and was overcome with depression. Although Pearson had two more abortions following her first, she since has become an advocate in the pro-life movement. And that pro-life movement is growing. As a third video from the Center for Medical Progress was released Tuesday, Pearson joined others at the #WomenBetrayed rally, organized by Students for Life of America, to discuss the misdemeanors of Planned Parenthood and why the 501(c)(3) should be defunded. According to Rep. Andy Harris, R-Md., Planned Parenthood exploits women and their babies, as evidenced in the recent videos. In 2013 alone, Planned Parenthood performed 327,653 abortions, and 94 percent of its pregnancy services were abortions. In just three years, from 2011-2013, almost 1 million abortions were performed by Planned Parenthood. Furthermore, according to Planned Parenthood’s 2013-2014 annual report, 41 percent of Planned Parenthood’s total revenue is derived from taxpayer funding. Dr. Ben Carson and Sen. Ted Cruz, R-Texas, said the words of the Declaration of Independence remain intact today and that Americans should question whether Planned Parenthood is supporting their values. Additionally, the Family Research Council’s Arina Grossu said the videos expose the truth of Planned Parenthood’s actions as baby trafficking.